Mike Schüssler agrees with Marthinus Stander that adding chicken to the tax-exempt basket ‘makes so much sense’. 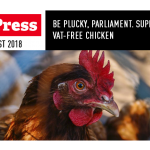 NOMPU SIZIBA: The South African Poultry Association says it’s going to continue to campaign for chicken to be exempt from Vat, or value-added tax. This is despite the fact that this issue was considered by the Woolard zero-rating panel, but they chose not to include it in their list of recommended products, citing uncertainty around whether the benefit of that discount would be transferred to the retail consumer. 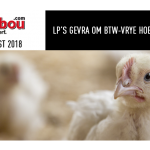 To speak on this issue and other related issues, I’m joined on the line by Marthinus Stander, who is the chairman of the South African Poultry Association’s broiler organisation committee. Later on, Mike Schüssler, chief economist at Economists.co.za, will join us. Thanks very much for joining us, Marthinus. You have lamented the Woolard zero-rating panel not listing chicken as one of the items that should attract zero-rating. Why is that? MARTHINUS STANDER: We are disappointed. I think it’s a fact that the most money spent by lower-income households is on chicken as a food item. Protein we know is good for mental and physical development, and chicken is the cheapest and the most versatile protein. So we thought this was an ideal opportunity to benefit both the poor consumer and the industry. NOMPU SIZIBA: The main reason the panel decided not to include chicken is they argued that they are not quite sure that the benefit would be passed on to the consumer. What is your response to that? MARTHINUS STANDER: Well, again, it’s a bit worrying that that is expressed specifically as to our industry and mine. The other industries producing all the other products have not been mentioned or singled out in discussion. So it is a bit puzzling to say the least. NOMPU SIZIBA: You say you are going to continue lobbying for chicken to be considered by the minister of finance. The panel’s work is done. What makes you think that you’ll be able to circumvent their recommendations and why are you, as a business that seeks to profit from the production of chicken, taking such an interest in this issue in the first place? MARTHINUS STANDER: The way we understand things is that it’s not over yet. There is still a process to follow, and we will still have the opportunity to influence the public debate. So that’s what we want to do. And, as I said, we believe in the value of including a protein in that basket, and we think chicken is the right protein. Also, from the industry’s point of view, if consumption is stimulated by such an event, then the industry and the country by and large can benefit significantly. NOMPU SIZIBA: Just speak to us about some of the benefits that you anticipate if that were to happen. MARTHINUS STANDER: Well, if the decrease is possible or could happen, we estimate that you could have a 7.8% increase in demand. Now, we know that for every 10 000 tonnes of chicken that we produce, we put about 1 000 people into jobs, directly and indirectly related to the industry. So that accounts for 11 000 jobs. There is obviously the benefit to GDP, which is estimated at R3.6 billion, and there will be additional government revenue. And you’ll find a lot more people in jobs. So we calculated that there will be R80 million in additional lower-household income available. NOMPU SIZIBA: Well, good luck with that fight. Let’s talk more broadly about the chicken industry. How is the sector coping, particularly with the inflows of imported chicken? Is that putting a damper on the industry’s profitability? MARTHINUS STANDER: The industry is in a better position than it was. But that is purely because we have good crops and rain, and the world stock in terms of maize is in a good situation. But we generally follow commodity trends and cycles. So the fundamentals haven’t changed. We still, with imports, are the single biggest, if you can call it that, producer in the country, and that’s why we know that we are a competitive producer of the full carcass compared to worldwide standards. So I always say that we are not dealing here with oil, which is something we have to import because we simply don’t have it. We can produce all the chicken that is used by the consumer, or consumed in this country. That has huge benefits for the country because we are in rural places and support rural development. This supports food security, it supports food safety and it obviously creates jobs. NOMPU SIZIBA: One of the things that’s being discussed currently – with the whole trade-war atmosphere, and minister Rob Davies of the dti saying that he’s been urging the US to lift the import tariffs around aluminium and steel – is that there are still concerns that they may decide to levy further import tariffs on South Africa in other areas. While this conversation is going on, people are suggesting that, should the US levy other import tariffs, then we should retaliate – and obviously chicken would be one of the areas where we retaliate. What do you think of that particular scenario, because it would be much bigger than chicken? MARTHINUS STANDER: Yes. I think it’s quite a daunting scenario as a smaller country, with the might of the USA and with a rampant president on that side. But we made a concession to make it possible for benefits to accrue to industries other than the poultry industry, and we agreed to a quota to be exempted from anti-dumping tariffs. But it was very clearly gazetted that, should any of the benefits fall away to the other industries, then our quota should be suspended as well until such time as the other benefits return. So I think this is a tool that can be used. But, from our side, it’s just about what is fair and right. We agreed on something and that agreement has been broken, so we think it’s fair that that quota is suspended. NOMPU SIZIBA: Thank you very much, Marthinus, for your input. As I said, all the best with that fight. I’m sure it will be beneficial to all of us if we can get Vat-zero-rated chicken. 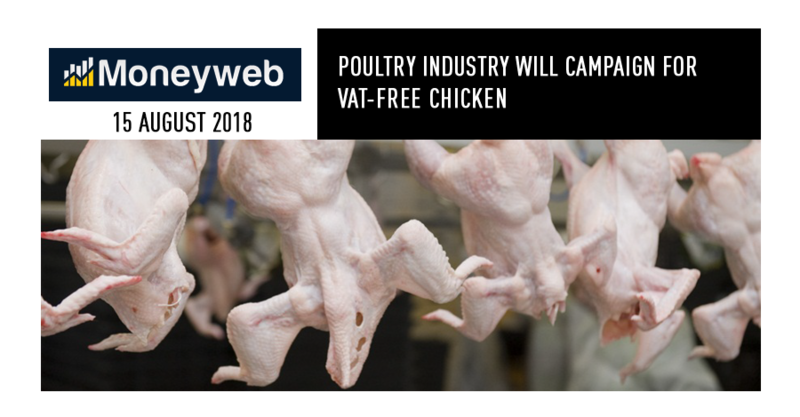 We continue the conversation about chicken, about it being Vat zero-rated, and just broadly speaking about the whole Vat-zero-rating issue with Mike Schüssler, the chief economist at Economists.co.za. Thanks very much for joining us, Mike. We’ve already spoken to Marthinus Stander, the chairman of the South African Poultry Association. Of course they’ve indicated that they are quite disappointed that there wasn’t a recommendation for chicken to be zero-rated. If that were to happen, how much might that cost the fiscus, and what measures could be put in place to ensure that it’s only the poor who get that benefit, to avoid more well-heeled households not paying tax on chicken? MIKE SCHÜSSLER: Well, I think whatever you are going to zero-rate, obviously rich and poor and going to benefit from it. But what you do, which is exactly what the committee did technically correctly, is you look for parts of chicken that are more likely to be eaten by the poor. So the individual quick-frozen chicken or whole chicken or half a chicken – those are the sort of things that the poorer households eat, whereas the richer households will eat the filleted breasts and they’ll have the crumbed chicken schnitzel, or whatever the case may be. I think that’s where the difference comes in. So one has to not make all chicken Vat-free. One has to look at it and say, well, the chicken that isn’t as processed and might be frozen, so it stays fresh for longer [should be zero-rated], because very often poor households don’t have much ability to keep things fresh, and they can bring something frozen home and have it in a cooler box for a day or three. I think those are the sort of things that one would have to have a look at from the chicken side. And I think the big thing for me is that there are very few protein items that are Vat-free, and protein is one of the major things that we should be looking at because, if we talk about poverty, we also talk about people not eating quite a balanced meal. If the Vat change can help, that would be great. NOMPU SIZIBA: Mike, do you think it was a fair consideration on the part of the zero-rating panel when they thought that it couldn’t be guaranteed that the customer would get the benefit from lower-priced chicken, even if the product were to become zero-rated? MIKE SCHÜSSLER: Well, they could then have the same argument with all items on the Vat-free exemption list. And another thing, I think they first of all are undermining the consumer. Consumers will ask the questions, they know more or less what some prices are, and they will ask why that price hasn’t fallen. The second thing they realise is that there are retailers in that chain, and those retailers are certainly very, very powerful when you are looking at producers. Retailers demand a lot from producers. In South Africa we have four or five big retailers and then we have a have a few medium-sized ones, whether it’s food and veg and the like. So ultimately I think we do have checks and balances in our system just through the market. So, yes, I think that’s a very silly thing to do because you are saying I don’t trust the system, and I don’t trust consumers. I think that’s not what the Vat committee should have been doing. They should be saying, “What can we give consumers to make their lives better?” not [wondering] how cheating is going to take place or something. NOMPU SIZIBA: Let’s look at the broader picture. What did you think of their recommendations? And of course there is a cost attached to it. Do you think government can afford it? MIKE SCHÜSSLER: Yes, I think R4 billion is not a big cost, and we’ve got to look at the picture. Chicken would probably add two or three billion to it. It would be the biggest product of all those products. It’ll probably become bigger over time because people do buy down. I think everybody is in trouble at the moment in the economy and people will look at getting benefits where they can. So ultimately, yes, the government is going to look at the bigger picture. Our tax base is well over R1 trillion. We are not looking at anything more than 0.1% in total of all the Vat-free items that are going to be added to it, so I don’t think it’s a major issue. And we are instituting a carbon tax, as far as I understand it, which would add to the fiscus from January. So ultimately we are again going to have a tax increase. Out of everything, we are already one of the highest taxed countries in the world. If richer countries are making food less expensive by not having the full Vat rate, or zero-rating a lot of food items, then I cannot see why a poorer country like South Africa doesn’t do the same. NOMPU SIZIBA: I get what you’re saying – that it’s a drop in the ocean. But of course we’ve got the likes of Moody’s coming out and saying that we are just not managing to get our fiscal house in order. The government is under a lot of pressure, rumours flying around [about] them needing to cut several billions off the public wage bill, in order to just balance things. So the picture doesn’t look great. MIKE SCHÜSSLER: No, the picture in South Africa is not great. There is no doubt about it. But not zero-rating chicken will not make a big difference to us. The bigger issue here is the government has to get its finances right and we’ve got to make sure that we fight the corruption. If they, for example, look at the illicit tobacco situation, they could probably get a few billion back there. Ultimately, why should the citizens of the country, and in particular the poorer consumers, have to sit with ever more taxes and ever more difficulty in making ends meet? We are the ones that are really, really squeezed and the government should be serving us, not the other way around. So I think, quite frankly, making chicken Vat-free, as the country’s biggest protein source, just makes so much sense to me on every level, and it really will help people have a more balanced life in terms of food. We are in a period where times are tough, but government is also going to have to cut back. You can’t just tax more. NOMPU SIZIBA: Let’s hope the finance minister heeds the call. Thanks very much Mike, for your time, as always.